This remodeled horse barn in Julian, Calif., is now used for entertaining and hosting large gatherings. The wood rafters, restored horse stalls, and newly stained amber-colored floor overlay preserve the room’s equestrian feel. The floor before restoration was filled with deep cracks and water trenches, which had to be filled before resurfacing could begin. The amber-colored stain gives the floor a warm, leather-like look. 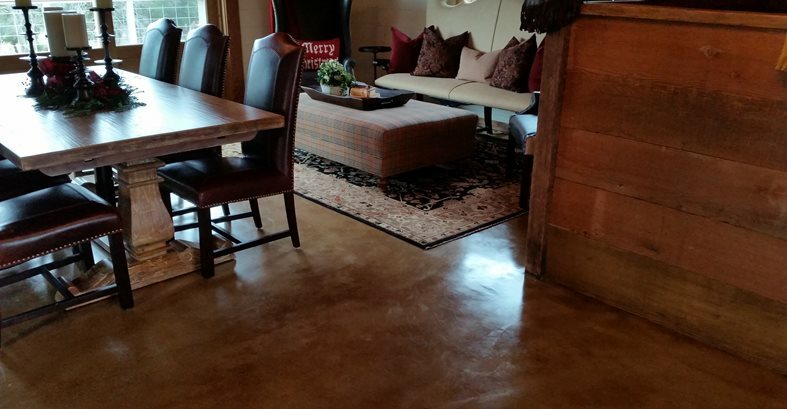 A polyurethane sealer and coat of floor wax will preserve its beauty and keep maintenance to a minimum. Another view of the newly restored floor. 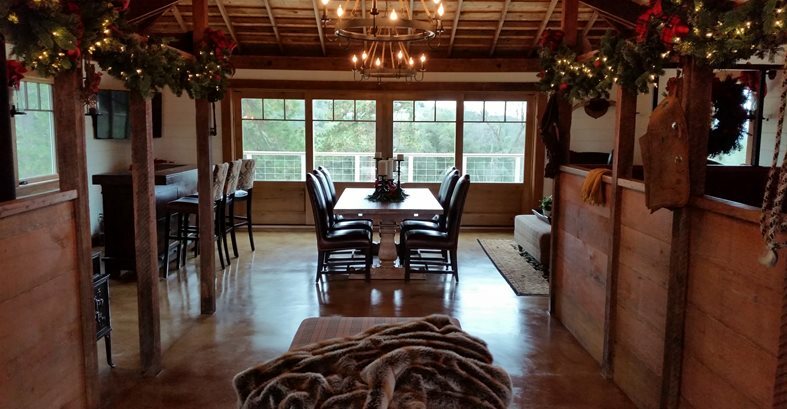 Imagine being faced with the task of converting an old, rundown horse barn into a posh spot for entertaining, starting with the renovation of a badly worn and cracked concrete floor. This enormous undertaking didn’t daunt Andy Espinoza and his crew at Envision Concrete. They eagerly took the reins of the concrete restoration challenge, with winning results. The homeowners purchased the property in Julian, Calif., five years ago, with the intention of remodeling the old 1940s barn and turning it into a place to host large gatherings. The existing 1,000-square-foot concrete slab had a very rough broom finish and was riddled with deep cracks. In addition, there were two wash-out trenches several inches deep in the back corners of the barn that had to be filled and leveled. First, Espinoza’s crew ground down the entire floor to smooth out the major imperfections, and then they filled the trenches with a fast-setting concrete underlayment reinforced with pea gravel for added strength. The next step was to open up the deep cracks in the floor with a V-blade crack chaser and then fill them with Super-Krete Bond-Kote, a ready-mix concrete repair and resurfacing product. After lightly grinding and etching the floor to remove all dirt and debris, the crew covered it with two coats of Bond-Kote and allowed it to cure. The final step was to stain the microtopping with an amber-colored stain to replicate the warm look of saddleback leather. After the floor was washed and neutralized, it was protected with two coats of polyurethane sealer and a coat of floor wax. “After completion of the project, I was told the owners were very impressed and amazed at how the floor was completely transformed. Everyone was very pleased, and the owners have received numerous compliments,” says Espinoza. Because the barn will be used only for occasional entertaining, maintenance of the floor will be minimal. “Simple mopping with a light detergent will be sufficient,” says Espinoza, who recommends reapplying the floor wax annually to keep it looking its best.